In a world of rising education costs and student loan debt, attending some of the best law schools in America can certainly set you back a bit. While the average cost of attendance for private law institutions is over $43,000 a year and more than $26,000 for in-state tuition, attending some of the highest-ranked programs could cost you more than $60,000 annually. And the value? One survey of graduates between 2000 and 2015 found less than 1 in 4 believed the cost of their education was worth it in the end. So what is life after law school really like today? To find out, we took a closer look at which law students are getting hired, how much they’re earning, and what getting through law school and the bar exam looks like across the country. We also took a closer look at the schools with the highest percentage of unemployed graduates. Read on to see what we uncovered. Getting through law school and passing the bar exam is no easy feat, but some states are known for having much more difficult exams than others. The state you graduate from isn't necessarily the state you need to take the bar in. Instead, consider where you want to practice law, and you’ll know which state testing on which to focus. In 2017, less than 2 in 3 students attempting the bar exam in Mississippi passed. The odds were only slightly better in some other states. In Arizona, Rhode Island, North Carolina, and California, between 64% and 66% of students who attempted the bar exam passed. The bar exam in California is notoriously difficult, and subsequently, the percentage of students who passed it was among the lowest in the country. If you’re looking for a place where the thought of passing the bar exam won’t keep you up at night, though, you might want to consider the Midwest. Home to cities with some of the lowest costs of living anywhere in the country, Oklahoma (87%), Iowa (87%), and Missouri (86%) had some of the highest percentages of students passing the bar exam. Nothing plagues law students like the fear of unemployment after graduation. After all, if you utilize student loans to get through law school, they won’t pay themselves after graduation. Fluctuations occur in nearly every job market, but 2015 saw a 19-year low in the number of law students hired right out of college. Of course, the number of students graduating was also lower, making the pool of available candidates smaller and more competitive. Knowing which schools have the highest percentage of unemployed graduates (and the lowest percentage of students not passing the bar exam) might help set you up for success moving forward. In 2017, more than 1 in 3 students from two schools were still unemployed after graduation: the Interamerican University of Puerto Rico and the University of La Verne in California. 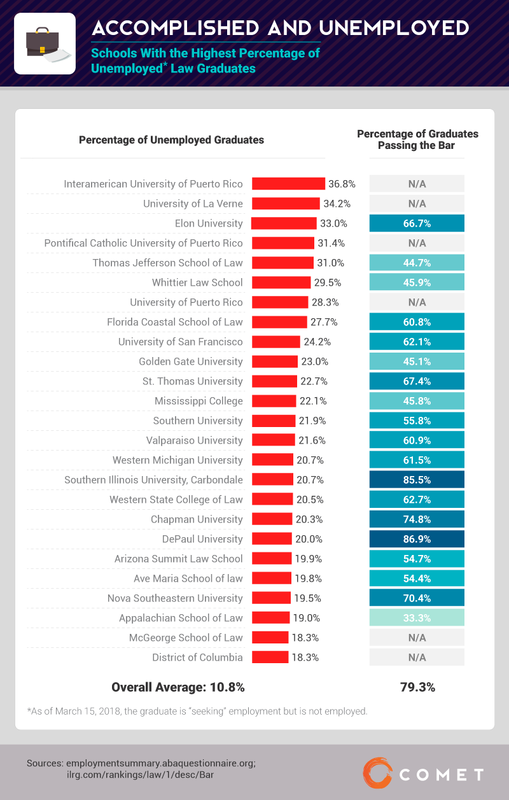 Other schools with similarly high percentages of unemployed law graduates included Elon University (33%), Pontifical Catholic University of Puerto Rico (over 31%), and Thomas Jefferson School of Law (31%). Before this scares you away from law school completely, however, consider this: In 2017, just over 11% of law school graduates were unemployed after completing their degree. Many factors can help determine the best law schools. Often, faculty, lawyers, and judges can weigh in on the rankings, and other external factors including student-faculty ratios and school expenses are taken into consideration. While these data certainly have their merits, there’s one thing most students are likely concerned about when it comes to their application and acceptance: getting hired. As our study found, graduates from Columbia University (ranked fifth overall by U.S. News & World Report in 2018) had the best odds of landing a job at a firm after law school. With nearly 83% of students finding positions at law firms, a vast majority were placed at large firms. More than 4 in 5 students from Columbia found jobs at law firms employing 501 or more people at the time. Roughly 1 in 4 lawyers in private practice work at large firms. The benefits of working in Big Law typically include higher salaries, more prestigious colleagues, and a more challenging workload. Of course, mega-firms can have their downsides too. Working with so many high-profile lawyers can make standing out a competitive process, requiring longer hours and extra work to get ahead. Like Columbia, Cornell (roughly 75%), the University of Virginia (over 73%), and New York University (over 72%) had the highest number of graduates hired by law firms after graduation. And like Columbia, a vast majority of these were also mega-firms with hundreds of employees. Working for small law firms can have its advantages too (including a more flexible schedule and hands-on experience). While nearly 71% of graduates from Lincoln Memorial University found jobs after school, everyone was at a firm with 100 or fewer employees. Recent reports indicate the average law school graduate owes more than $112,000 in student loan debt. For some, more prestigious schools can leave students with even more debt, closing in on nearly $200,000 without a guarantee of employment in the end. The standing of the firm law students get hired by after graduation is one thing, but how they start their careers is something else. In light of the cost of education and student loan payments, getting paid is an important consideration. Thankfully, the future might not be so bleak after all. Graduates working in smaller firms (with 100 or fewer employees) tended to earn less. At most, 37% of graduates at these firms earned less than six figures in their first year after school. That figure fell to under 16% among graduates working in firms with 101 to 250 employees. Looking to earn more? Big Law might be the way to go. Nearly 1 in 3 graduates hired at firms with 251 to 500 employees earned $180,000 or more in their first year, and nearly 47% in firms with 501 to 700 employees earned the same. 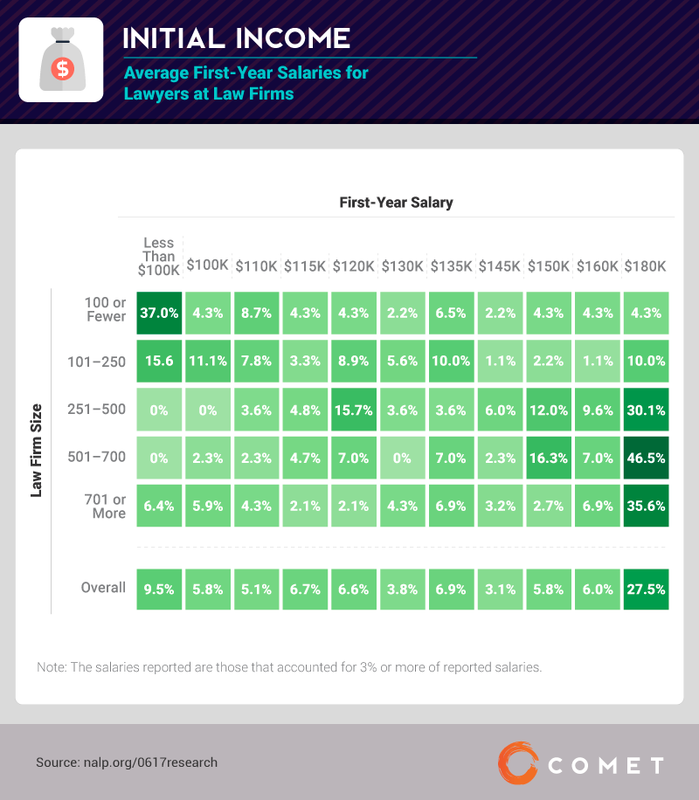 Overall, more than 1 in 4 graduates hired by a law firm earned $180,000 in their first year out of college. Deciding which law to practice can be one of the most difficult decisions a student faces. There are a few indicators you might recognize in advance though, and having even a vague idea what type of lawyer you want to be in the end might help you pick the best law school for your career path. Depending on the situation, corporate law, a private practice, or perhaps a government job might suit you best. As our chart displays, some schools might be better than others for students looking to be hired by specific law firms after graduation. Graduates looking for flexibility and a high return on their education might want to consider a solo venture rather than a law firm. Establishing your own working environment has its perks, and the overhead cost might not be nearly as high as you think. In 2017, 10% of graduates from Southern University and A&M College went on to become solo practitioners, followed by roughly 9% of graduates from UNT Dallas College of Law and about 8% from Concordia University Law School. Getting into law school might eventually get easier, but getting through law school (and the bar exam) seems to be getting harder. On the other hand, the median salary for graduates increased in 2015 to over $64,000, and students landing jobs in private firms averaged $100,000 in salary. With numbers like those, it’s hard to say definitively if the “lawyer bubble” really has popped. While alma maters are an important consideration for people pursuing law, it could be more important now than ever before. If you’re passionate about a career in law, but the fear of student debt looms over you, let Comet help guide your financial future. Refinancing student loans can change your life, and our network of lenders is here to help you find the relief you need to pursue your dreams. If loan debt is holding you back from buying a house, getting married, or even getting a new car, let us help you start saving with the right lenders. Calculate how much you could save on your student loans by refinancing today with Comet. Using 2017 data from the American Bar Association reported by law schools, we analyzed where students went to work after law school and which schools had the highest rates of unemployment. We pulled data on bar exam results from the National Conference of Bar Examiners and Internet Legal Research Group in 2016 and 2017 respectively. First-year law salaries in 2017 were taken directly from the National Association for Law Placement (NALP). States have different bar exams and requirements for passing the bar exam. By February 2019, 30 jurisdictions will have adopted the Uniform Bar Examination (UBE), which will allow for people to practice law in other states that use the UBE. States that have not adopted the UBE use their own state bar exam. Seeing the future of law a little differently now? We’re happy to see the results of this study shared with your readers for any noncommercial use. No exam necessary; just ensure a link back to this page so that our contributors get credit for their work too.